Glides effortlessly over the eye. 209 Eye Liner Brush is a M.A.C eye brush. 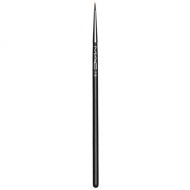 Its firm synthetic fibers delivers a precise, firm, even stroke with which to line the eyes. Ideal to use with liquid or cream eyeliner. Use to create a precise stroke.